Heel pain is most often caused by plantar fasciitis, a condition that is sometimes also called heel spur syndrome when a heel spur is present. Heel pain may also be due to to other causes, such as a stress fracture, tendinitis, arthritis, a nerve irritation, or, rarely a cyst. Heel pain can also be due to degenerative arthritis in the lower back that refers pain into the heel area. Because there are several potential causes of heel pain, it is important to have heel pain properly diagnosed and treated. As well the longer the condition persists generally the harder it becomes to treat. Plantar fasciitis is an inflammation of the band of tissue ( the plantar fascia ) that extends from the heel to the toes. In this condition, the fascia first becomes irritated than inflamed resulting in heel pain. pain that is usually worse upon arising. pain usually increases of over a period of months. People with plantar fasciitis often describe pain as worse when they get up in the morning or after they’ve been sitting for long periods of time. After a few minutes of walking the pain decreases, because walking être he’s the fascia. For some people the pain subsides but returns after spending long periods of time their feet. The most common cause of plantar fasciitis relates to faulty foot structure. For example, people who have problems with their arches , either overly flat or high arched feet are more prone to developing plantar fasciitis. Wearing non-supportive footwear ( especially on hard surfaces) puts abnormal strain on the plantar fascia and can lead to plantar fasciitis. This is particularly evident when a person spends long hours their feet. Obesity also contributes to plantar fasciitis. To arrive at a diagnosis Dr. Bank will obtain a thorough medical history and examine your foot. 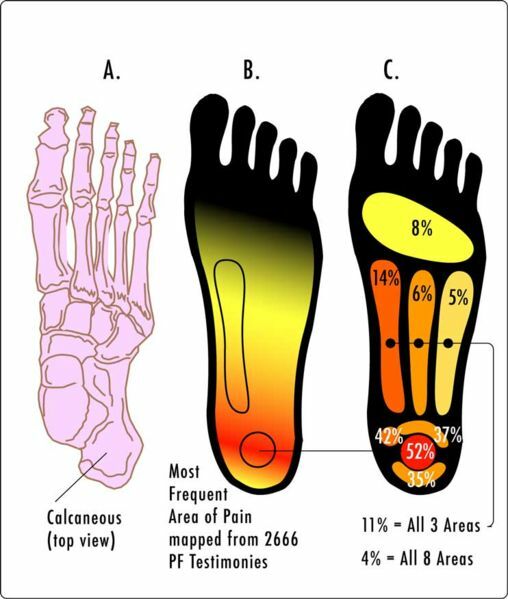 Throughout this process Dr. Bank will rule out all the possible causes of your heel pain other than plantar fasciitis. In addition , diagnostic imaging studies such as x-rays and ultrasound may be obtained. These modalities are available in our office for patient convenience. In some cases MRI and blood work may be obtained to distinguish the different types of heel pain. Sometimes heel spurs are found in patients with plantar fasciitis, but these are rarely a source of pain. When they are present the condition may be diagnosed as plantar fasciitis /heel spur syndrome. STRETCHING EXERCISES. Exercises that stretch out the calf muscles help ease pain and assist recovery. AVOID GOING BAREFOOT . When you walk without shoes , you put undue stress an strain on your plantar fascia. LIMIT ACTIVITIES. Cut down on extended activities to give your heel a rest. SHOE MODIFICATIONS. Wearing supportive shoes that have good arch support or slightly raised heel reduces stress on the plantar fascia. Your shoes should provide a comfortable environment for the foot. MEDICATIONS. Ibuprofen or Alieve may reduce pain and inflammation. If you still have heel pain after taking these steps it is important that you see Dr. Bank so the source of your heel pain can be properly diagnosed and treated. One or more of the following are additional treatments that may be recommended. PADDING AND STRAPPING. Placing a pad in the shoe softens the impact of walking. Strapping helps support the arch and reduces the strain on the fascia. ORTHOTIC DEVICES. Custom orthotic devices that fit in your shoe help correct underlying structural abnormalities causing plantar fasciitis. INJECTION THERAPY. I n some cases corticosteroid injections are used to help reduce the inflammation and relieve pain. REMOVABLE WALKING CAST. A removable walking cast may be used to keep your foot immobile for a few weeks to allow your foot to rest and heel. NIGHT SPLINT. Wearing a night splint allows you to maintain an extended stretch of the plantar fascia while sleeping. This may help reduce morning pain experienced by some patients. Although most patients with plantar fasciitis respond to non-surgical treatment, a small percentage of patients may require surgery. If conservative measures fail to relieve a patient’s heel pain,surgery will be considered. Dr. Bank will thoroughly discuss the surgical options with you and determine which approach would be most beneficial for you. By utilizing minimally invasive techniques which are now available most patients are able to begin walking immediately after surgery with minimal discomfort. No matter what kind of treatment you undergo for plantar fasciitis, the underlying causes that led to this condition may remain. Therefore, you will need to continue with preventive measures to prevent recurrent heel pain.